Pickering Interfaces will be exhibiting at The European Microwave Exhibition in Madrid from 25th - 27th September 2018. This event is Europe’s largest trade show dedicated to the Microwaves and RF Industry. At booth 280, the company will show a range of RF & Microwave switching products that increase test system effectiveness and productivity. This year at EuMW they will be launching a 13-model family of PXI 8 GHz solid-state RF switches, including SPDT, SP4T, SP6T, SP8T, SP16T and 4x4 Matrix devices. Pickering Interfaces’ series 40-88xA high-performance switch family now covers 10 MHz to 8 GHz in the modular PXI format for easy system integration. All units feature automatic termination of unused switch channels, up to +36 dBm input power handling and excellent RF performance characteristics. 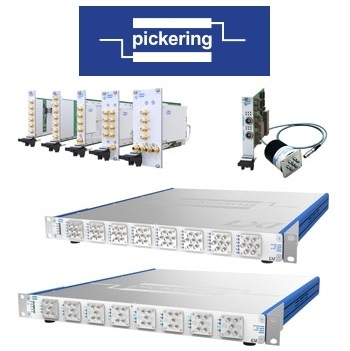 Also new from Pickering Interfaces at European Microwave will be the series 60-801 and 60-802 four and six channel LXI Ethernet microwave multiplexers. Packaged in compact 1U and 2U rack-mount form factors, these high-performance microwave switches are available with up to 16 relays in 6 GHz, 18 GHz, 26.5 GHz or 40 GHz bandwidths. They feature excellent RF and repeatability characteristics and are simply-controlled via the 1000Base-T Ethernet interface. Pickering’s larger 60-103B LXI 18-slot rack-mount chassis will showcase a variety of the company’s high-performance PXI RF and microwave switch modules, from 300 MHz to 65 GHz, including several terminated switches, where unused channels are automatically terminated in 50Ω for more consistent RF performance. Most of the microwave switches shown have LEDs on the front panels to show the energized switch paths – a very useful feature when debugging test programs. Also shown will be Pickering's PXI remote microwave multiplexer controller module. The single PXI slot 40-785B occupies less chassis space than a standard microwave switch module, and allows up to three microwave relays to be placed close to the DUT and other RF test equipment. In some applications, this can shorten the length of RF cable runs and improve system performance. The remote relays are supplied complete with a 1.5m interface cable.